South Carolina has a huge range of game! Anything from bear, dove, coyote, fox, quail, wild hog, even alligator! Did you think we forgot to mention deer? South Carolina has one of the largest deer seasons in the United States! From August to January, you can guarantee you’ll find a trophy that’s worthy of bragging. There’s more than just hunting! From historic locations, such as Fort Sumter and Charleston, to the pristine coastal areas of Hilton Head Island and Myrtle Beach, you’re sure to enjoy a variety in your vacation. Still looking to get lost in the outdoors? South Carolina has public land worthy of camping, hiking, and fishing! No matter if you’re looking to bring home your next trophy, spend some time fishing, taking in the sights or a combination of the three, South Carolina is the place for you. Hunting in South Carolina can give you and your family plenty of opportunities to create lasting memories. Considering a hunting lodge for your next trip? Cedar Knoll is a premier lodge that specializes in deer, hog, and quail hunts with Southern hospitality. For more on our accommodations and hunts, check out our contact page! This entry was posted in Uncategorized and tagged Hunting in South Carolina on September 22, 2016 by 15803827. Lodge amenities are a significant factor to weigh before booking. Ask about if you will be camping, sharing rooms, or will have private spaces. Also, ask about what they provide in regards to meals and supplies. Some will provide a list of what you should bring! Be sure you ask about what licensing the lodge has, what your guide has, and what licensing you should have for the trip. Not only does this affect pricing, but it can also cause you to run into a few issues before your hunt if you aren’t licensed properly. If you have anyone who is not hunting in your party, make sure there are activities at the lodge or nearby for them. Most lodges have some on-site activities, but see if the surrounding area has any major tourist sites or things to do. Just by taking time to ask the right questions, you can save yourself and your group frustration. Be sure to read up and even call the lodge you’re interested in before booking. For a Southern hospitality style hunting experience, contact us! At Cedar Knoll Hunting Lodge, South Carolina, we’ll make sure you experience an exciting, hassle-free hunting trip! This entry was posted in Uncategorized and tagged hunting lodge south carolina on September 15, 2016 by 15803827. Venison Chili – Paring ground venison with meat like beef and pork makes a unique and hearty meal. Make a big pot of the chili and have a bunch of friends over for a meal on a cold evening! Venison Roast – You can a venison roast for any special holiday or Sunday dinner. Cook your venison with bacon on a bed of vegetables like onions, carrots, potatoes, and celery. Once it’s done, you’ll be able to make delicious gravy with the pan drippings. Venison Steaks – When cooking steaks, it’s important to let your meat age a bit and cook it rare. Most people cook it with plenty of salt, as well as oil and butter. 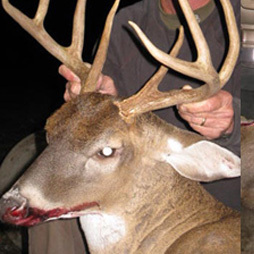 If all this talk about cooking venison has made you hungry, then it’s time to go hunting! Deer season is happening right now, so have a unique South Carolina deer hunting experience at Cedar Knoll. When you hunt with us, you’ll be able to hunt on private land! This entry was posted in South Carolina Deer Hunting on September 15, 2016 by 15803827.